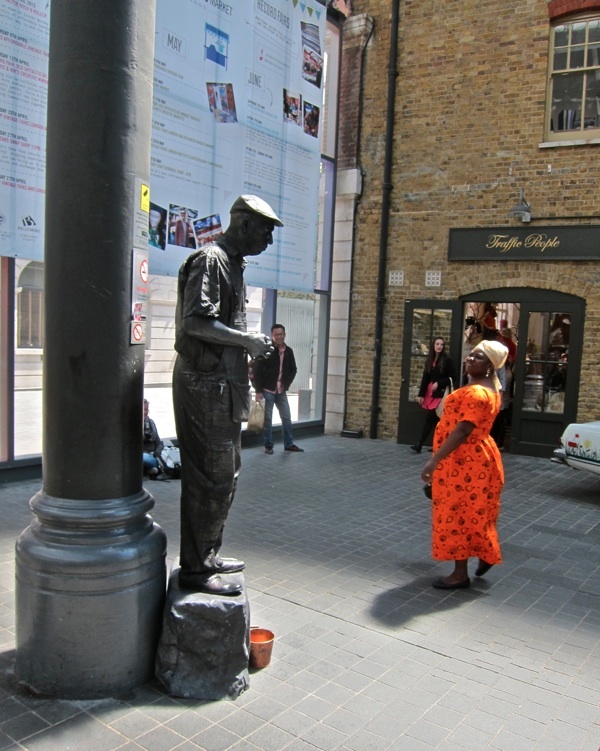 Did you ever walk through the Spitalfields Market and feel the lightest touch upon you, as if the ghost of some long-departed market porter were reaching out across time? 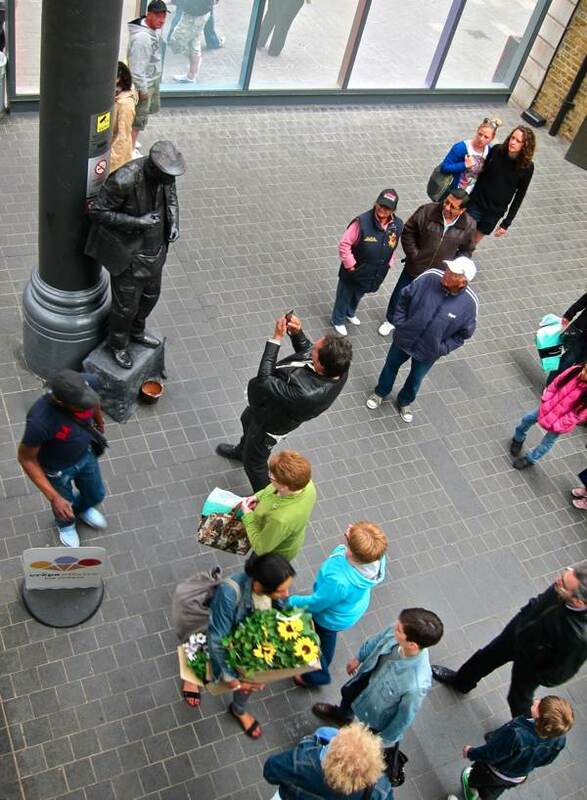 Very likely that was Matt Walters, the human statue, who has been standing on a box in the market for the last ten years and become the catalyst for the long-running drama that takes place in the narrow passage between the Creperie and the Rapha Clubhouse. 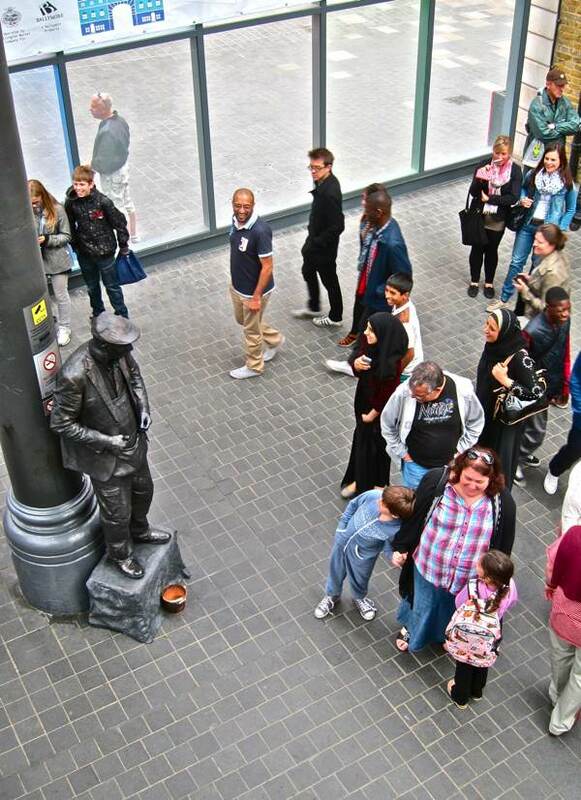 As visitors arrive in the Spitalfields Market, walking from the new development into the old building and enjoying the historic ambience, including the bronze figure of a man in flat cap, they are sometimes shaken from their reverie by a tap on the head from the living statue. 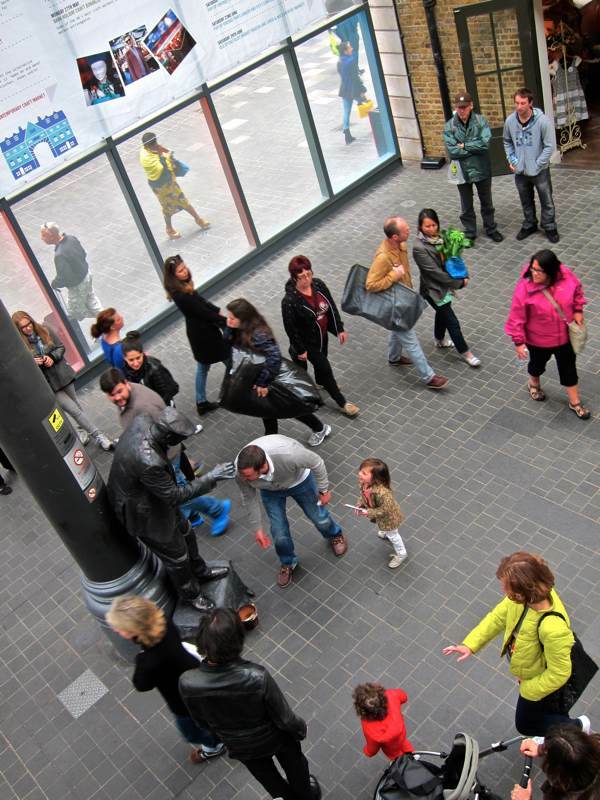 The innocent hilarity thus engendered has become an attraction in its own right and you will regularly find a small crowd assembled here with cameras at the ready to record the never-ending amusement as a stream of unwitting newcomers are bamboozled in similar fashion. 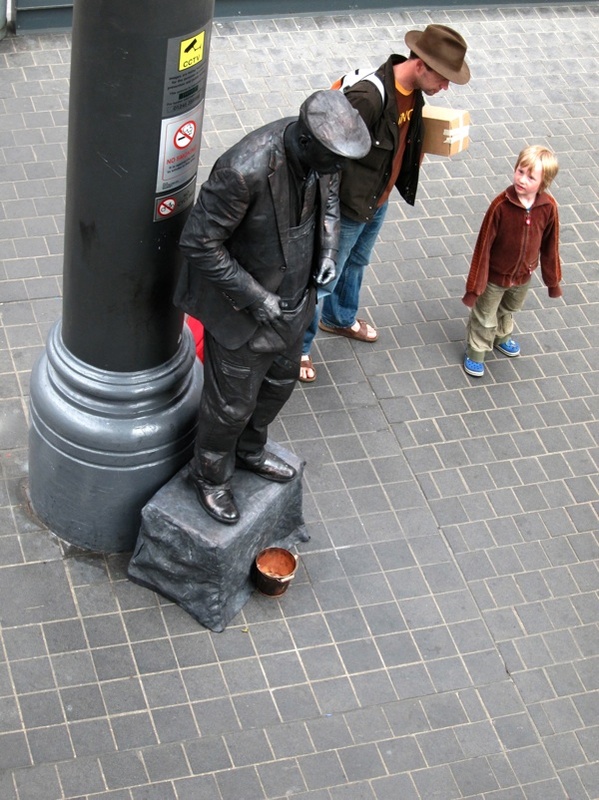 The mysterious and slightly sinister charisma of the human statue is one of enduring fascination to adults and children alike. Most people are more than willing to enter into the light-hearted complicity required, with the rare of exceptions of little ones that become gripped with abject terror and big ones whose dignity is affronted by such unwarranted mischief. 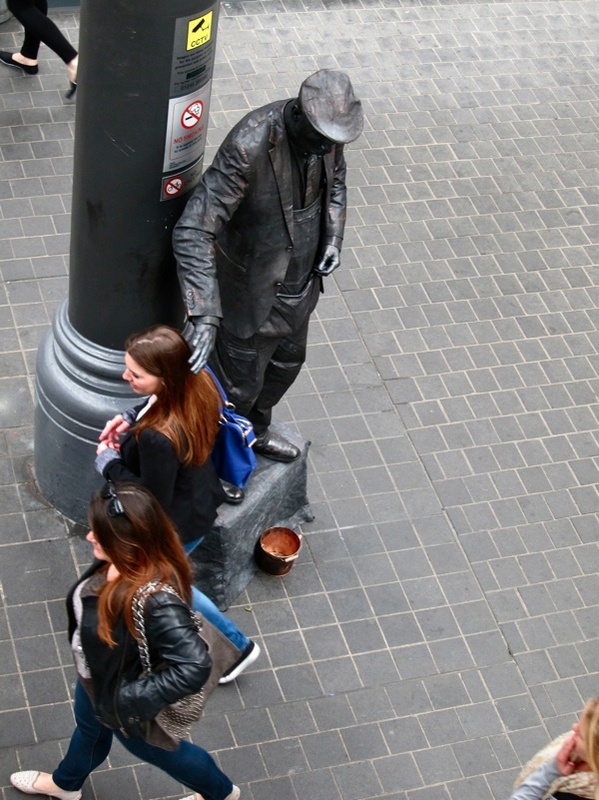 Yet, succumbing to the pull myself – like some latter-day Don Giovanni – I arranged a private assignation with the statue and he favoured me by breaking his customary silence. “My father a was an Orthopaedic Surgeon and General Practitioner, but I left school after I flunked all my O levels. Then I lasted a couple of months studying catering until the craze of robotic dancing came in, and I found I was good at it and I could make a living out of being a robot. That was fifteen years ago, so I have been doing this for twenty-eight years now. It’s really hard to stand still, it takes a lot of core strength and you have to breathe quite shallowly. I’m looking around for who to pick and you can always tell who’s comfortable by the way they walk towards you. I lower my heartbeat while I’m standing, my pulse goes down to twenty-eight and I feel very relaxed. It nearly killed me in November though, because I had blood clots in my lungs and the doctor said it might be from standing still such a long time. But I am fully recovered and you know, ‘Worse things happen at sea!’ I hope I’ll be doing it for a few years yet, because no-one can see my age under the make-up. The oldest human statue is in the Ramblas in Barcelona – he is seventy-four and he looks like the perfect statue of a wizened old man. I love what I do and there is the freedom of choosing your hours. Each day, I start at 11:30am and finish about 7:00pm with a few breaks in between. A policeman said to me, ‘Every time you touch someone, technically you are assaulting them.’ but people understand that it’s harmless. I’m very lucky with the comments I get, people say, ‘I’ve never seen anything as good as that.’ I’m at the top of my tree. 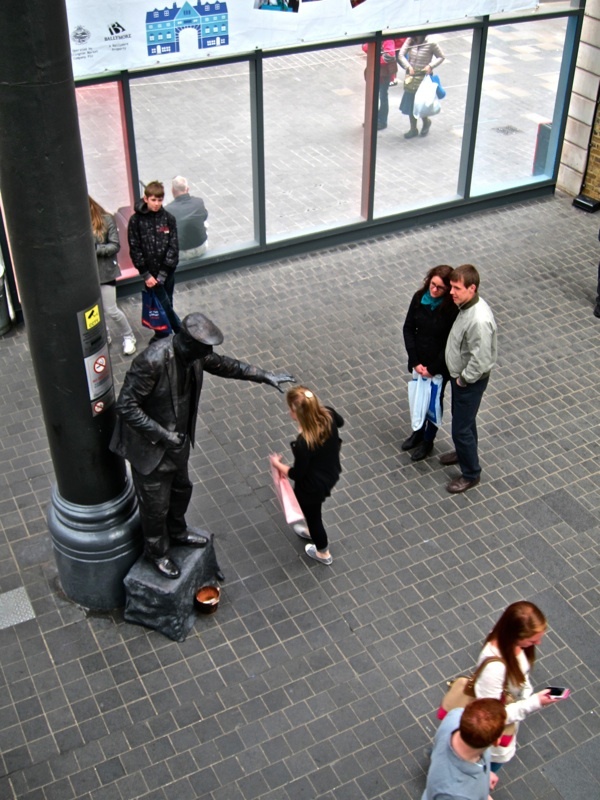 I’m not begging, I’m a performer and people choose to put money in the tin or not. You always give your best performance and let people take as many photos as they like, whether they give you something or not. Before the recession, business was really good. I had thirteen people working for me at one time – training them up, breaking them in and teaching them how to apply their make-up. I’d have four or five corporate events each week and at least one wedding each weekend. In the early days, I did the opening of every new Specsavers, that’s three hundred and sixty shops. And I did all the openings for Hotel du Vin too, for a while we were synonymous. 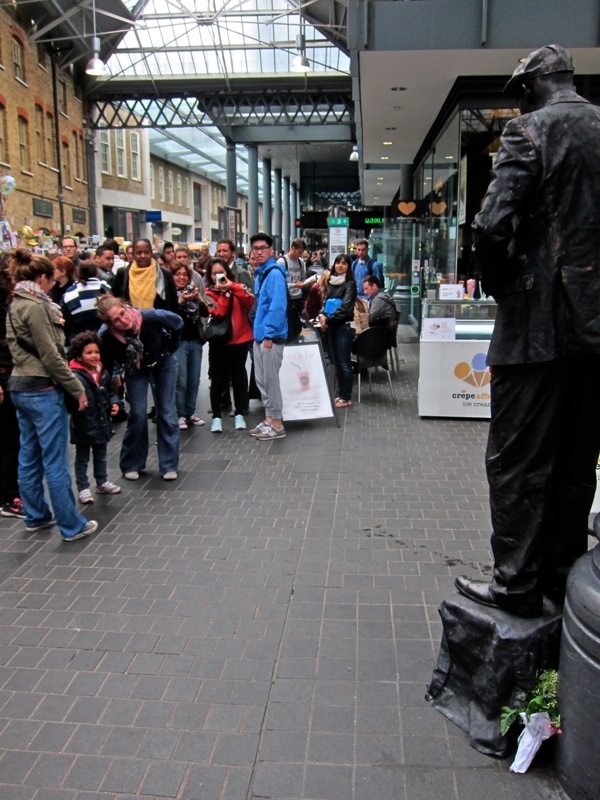 It was a successful business until it all came crashing down around me and now I am a solo street entertainer – doing Spitalfields each Sunday, South Bank on Monday, Kingston on Thursday or Friday, and Wimbledon on a Saturday. It all depends where I’m racing – I used to do ultra-marathons but now I do cycle racing. My other passion is bird watching, I’ve seen the Peregrine Falcons at St Paul’s and at the Barbican. Half my ear is listening to birdsong and the other half is listening to people around me – you get so much more attuned when you are silent. I dress up as a Chimney Sweep generally, but if it gets hot I paint myself white all over like a Sandstone Figure. I only do that if there’s a shower because otherwise it takes six boxes of baby-wipes to remove the make-up. I have great skin because I’m always exfoliating. I do other colours as well, so if there’s a corporate logo I can spray it on my body with a stencil and match up the colour. I also do a Roman Centurion, Stars & Stripes for 4th July, and Verdigris, and I do a Torch Bearer with a real flaming torch for night-time. 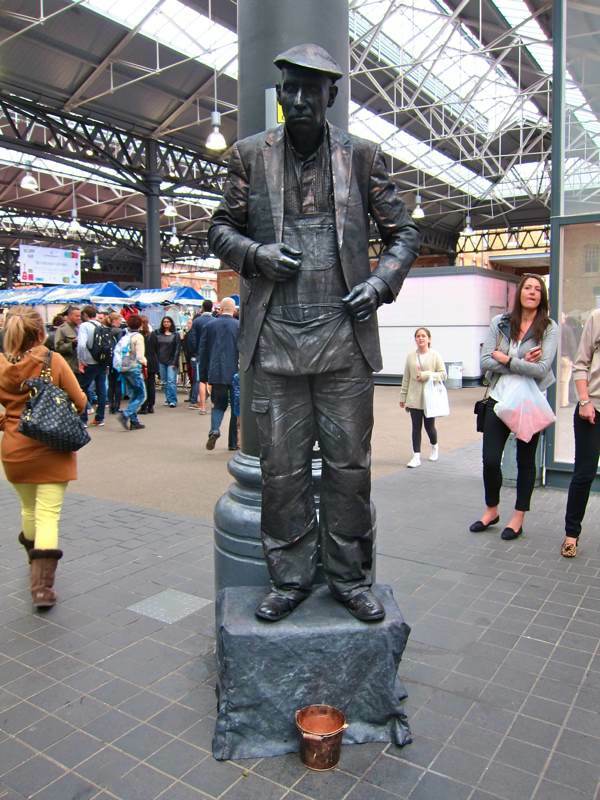 I don’t wear gold or silver, I make myself up to look like a real bronze statue. 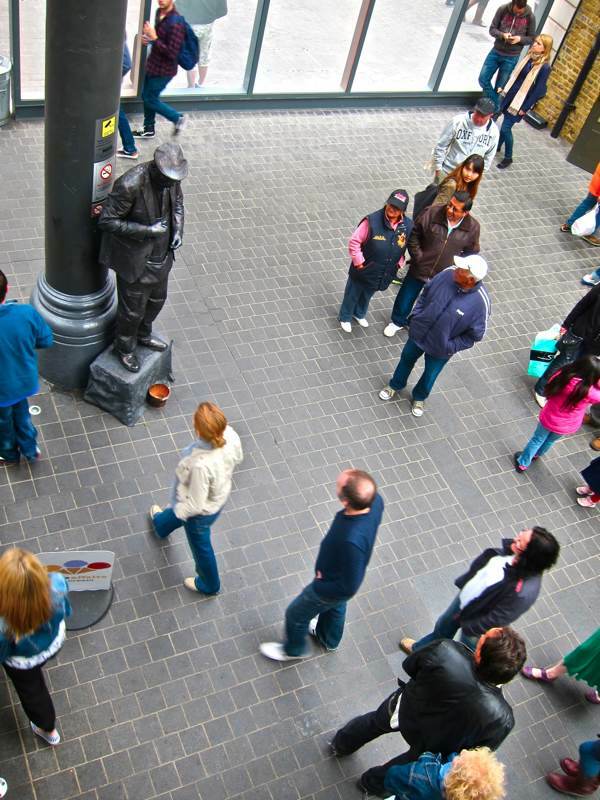 I was Planet Hollywood’s human statue at the Trocadero for eight years. I was there for the Olympics and I’m going back for four or five days a week this summer. They regard it as a kind of subliminal advertising because people get involved with my act and then they go into the restaurant. 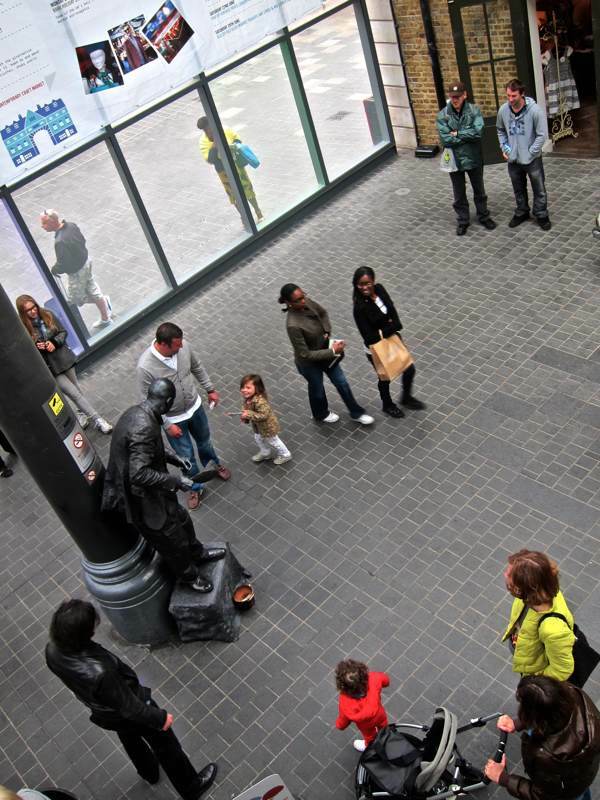 Nowadays, there’s all these people down in Covent Garden with masks which I regard as cheating. In my time, there used to be the Doggy Man who sat in a cat basket, Duncan the Silver Gladiator and the Leaning Man, who had his shoes nailed to a board and could lean forty-five degrees. There were four of us lined up, so you had to work hard to earn your money but I enjoyed the competition. 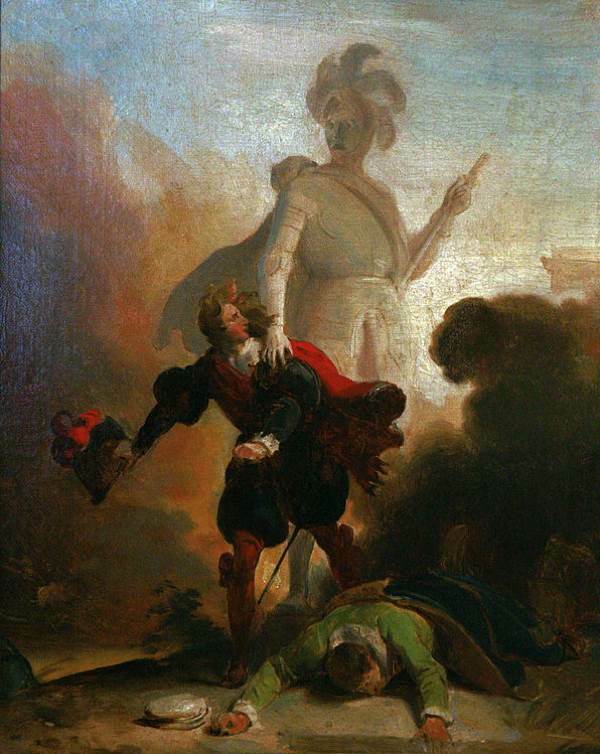 Don Giovanni and the Statue by Alexandre-Évariste Fragonard, c. 1830-35. I love the photograph of the woman in the orange dress but If I had been the young woman with the long hair and he had touched me like that I would have jumped out of my skin. I will pay a visit to the market but will be keeping my distance! How wonderful and what an amazing life. Although it may not seem like it, stading motionless for hours on end is hard work… And I agree, wearing a mask is “cheating”. fascinating and beautifully written. sad how much we take for granted and miss. Where else would we able to read such an incredible story?